← Syrian Archbishop says "Public opinion in the West is held hostage by the media"
The nomination has been made by Nobel peace laureate Mairead Maguire of the Peace People of Ireland. 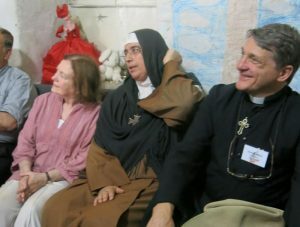 Mother Agnes Mariam of the Cross (civil name Fadia Laham) and the Mussalaha Reconciliation Initiative in Syria, has been nominated by Mairead Maguire, Nobel Peace Laureate, for the 2014 Nobel Peace Prize. ‘At a time when the world so desperately needs to see a peaceful way forward to end the bloodshed and Conflict in Syria the Mussalaha initiative stands out as a beacon of hope showing us a better way forward, one which comes from within Syrian Society and expresses the spontaneous desire of the majority of Syrians for a peaceful path, a way forward that departs from violence and embraces a future where differences are resolved in an atmosphere of mutual respect that preserves the historic fraternity of the Syrian people. The Mussalaha initiative is an outstanding example of the resilient spirit of the Syrian people and their innate ability to resolve their difficulties, by themselves, even in the most tragic and exceptional of circumstances, we have a duty to support their work in every way possible. Over the last two years the Mussalaha Initiative has worked in mediation and negotiation often crossing lines of conflict in the most difficult and life threatening of circumstances. Many abducted people have been freed, prisoner swaps facilitated, humanitarian aid supplied without discrimination, evacuation of civilians from conflict zones made possible, and disarmament of local opposition fighters peacefully facilitated. Principle among those who have worked tirelessly for this peace initiative is Mother Agnes Mariam, with courage and conviction she has been an outspoken advocate of peace, a voice seeking justice and one which has consistently called on the international community to recognize the truth with regard to what is happening in Syria. Mother Agnes Mariam’s astute observations which discredited the video evidence offered by the United States, as proof of an alleged chemical gas attack in East Ghouta, contributed to help forstall what would have proved a regionally devastating external military intervention in Syria. This heroic peacemaker has thought nothing of placing her own life on the lines for the sake of others and at great personal risk, she personally brokered a cease-fire between rebels and the Syrian authorities in Moadamiya, Damascus province. This work facilitated the transfer of over 5,000 civilians from a besieged opposition area and included the voluntary surrender of over 500 men many of whom had been armed opposition combatants. In making this nomination for the 2014 Nobel Peace Prize, I believe that there is no military or paramilitary solution to the Syrian conflict and only through dialogue and negotiation can peace be reached. We urgently need a peaceful solution to the crisis in Syria. Mother Agnes Mariam and the Mussalaha Initiative in Syria exemplify all that is remarkable about the resilience of humanity when faced with unbelievable adversity. The Mussalaha initiative which unites people of all faiths, and none, and ethnic backgrounds, deserves to be nurtured supported and fully recognized for the enormous contribution it has made, and continues to make in saving lives, and in directing all Syrians towards the path of peace. This entry was posted in Press Release, syria now and tagged mairead maguire, Mother Agnes, mother agnes mariam, Nobel Peace Prize, syria. Bookmark the permalink. Thank you for turning the curtain back showing and lifting up a wonderful sister. I am amazed and the shakers of peace. The guts the nonglory, the nonfight. Also thanking for writing it gives me a sliver of news and awarness which I always fancy.